If you could have a sommelier for steaks Dave Faulk would be it. He is the Eagle, Idaho carnivore’s connoisseur with his Traeger grills fired up just outside of his Porterhouse Market, The Porterhouse was the natural next-step evolution for Faulk, the son of a large animal veterinarian. Faulk grew up living and breathing livestock before going into the food industry, first on a small beef ranch in northern Idaho and finally, a dairy farm in eastern Oregon. His high school senior year, he worked at a packinghouse in Eagle, Idaho where he learned butchering and packing sausage, handy skills he still uses today. The following two summers he fished for Halibut, salmon and Dungeness crabs on Kodiak Island in Alaska. All of those influences culminated in inspiring Faulk’s appreciation for our food sources, and ultimately founding Porterhouse Market. Twenty-three glowing Yelp reviews can’t be wrong. The grape and bleu cheese macaroni salad is a one-of-a-kind stand out. The soups are made fresh daily. Faulk’s friendly, attentive on-site staff recommends spices, rubs and blends with the attentive care of an apothecary prescribing elixirs. 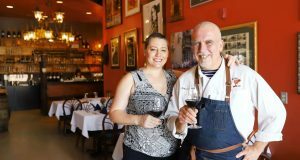 Their wine selection is thoughtfully curated and the staff is happy to advise customers on pairing wines with any of the foods they buy here. All of their products make thoughtful housewarming gifts for those impromptu dinner-at-a-friend’s-house invites. 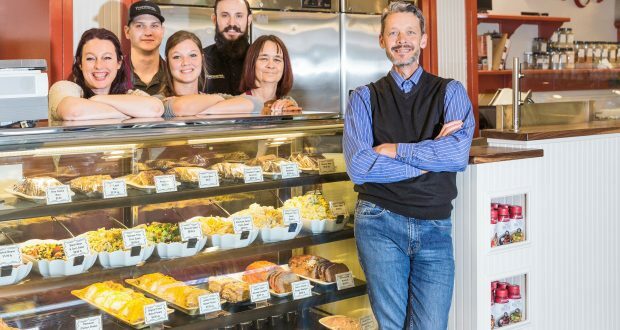 For Faulk’s fellow carnivores, the display case is a museum of meat, where you can almost hear the choir of cherubs harmonizing in the background as customers slowly approach the case in reverence. But don’t let the Porterhouse part of their name fool you. Their pork, fish and seafood offerings are fresh, high end and without equal. 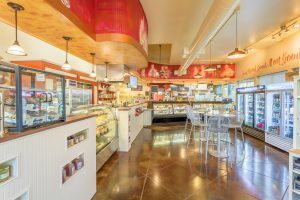 Porterhouse Market’s potpies, lasagna, deli salads and the we’ll-ignore-calories-just- for-today tantalizing dessert bar (with gelato now on the menu) are all working in concert, coaxing the customers. There is something for every palate here. Home to Eagle’s best prime meats, Porterhouse Market provides meat to highprofile restaurants like Fork, Alavita and Rudy’s. Between the bread—delivered to him fresh daily from Gaston’s—and the deli with its fresh sausages (where else will you find Kobe beef hotdogs?) 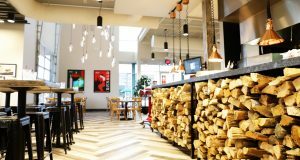 the Porterhouse Market has become the second home for customers who appreciate prime meats, a cozy atmosphere and a diverse deli. 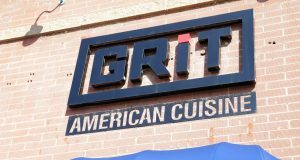 Be sure to stop in and meet the friendly staff, get their advice and enjoy a quality nosh session. Discover Eagle’s ultimate foodie experience that you’ve been missing. Previous: Idaho Rockets Flying In Washington D.C.